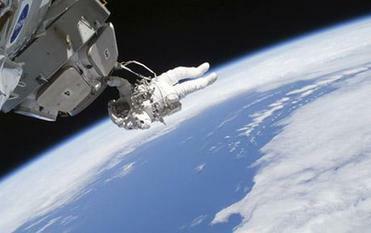 Only professionals with space flight experience need apply, such as British NASA astronaut Nicholas Patrick, pictured here holding on to the International Space Station. An American space holiday firm, Bigelow Aerospace, has become the first commercial company to advertise for professional astronauts. The firm, founded by Bob Bigelow, the head of a budget motel chain in the US, wants experienced spacemen working in orbit and on the ground. Applicants must also have completed a training program with a government or recognized space agency, such as NASA, and to have flown a space mission. Mr Bigelow, from Las Vegas, already has two test models of his inflatable space modules in orbit around the Earth, launched by Russian rockets. He plans to build orbiting hotels to provide out-of-this-world holidays and has his sights set on the Moon and even Mars too. Bigelow& #39;s modules, which can be linked together sausage-style to form a space station, are launched in compact form and then expanded to full size. * Helping clients with payloads or experiments. On Earth the spacemen will train new astronauts and operate mission control. Mr Bigelow, who made his fortune from Budget Suites of America, is aiming to bring the cost of a ticket to space down to £30,000-£60,000. His other big ideas include a cruise ship to carry 100 passengers and 50 crew on a trip around the moon. As well as the unspecified number of astronauts& #39; positions the company has 44 other job offers on its website. They are likely to appeal to NASA staff uncertain about the future after President Obama cancelled any return to the Moon. With NASA& #39;s shuttle fleet scheduled to be retired at the end of this year and no successor craft on the near horizon, thousands of workers expect to lose their jobs.